Lexington, Ky. – Nov. 29, 2017 – For the second year in a row, Louise Leatherdale and Leatherdale Farms received the prestigious Adequan/USDF Dressage Breeder of the Year award. 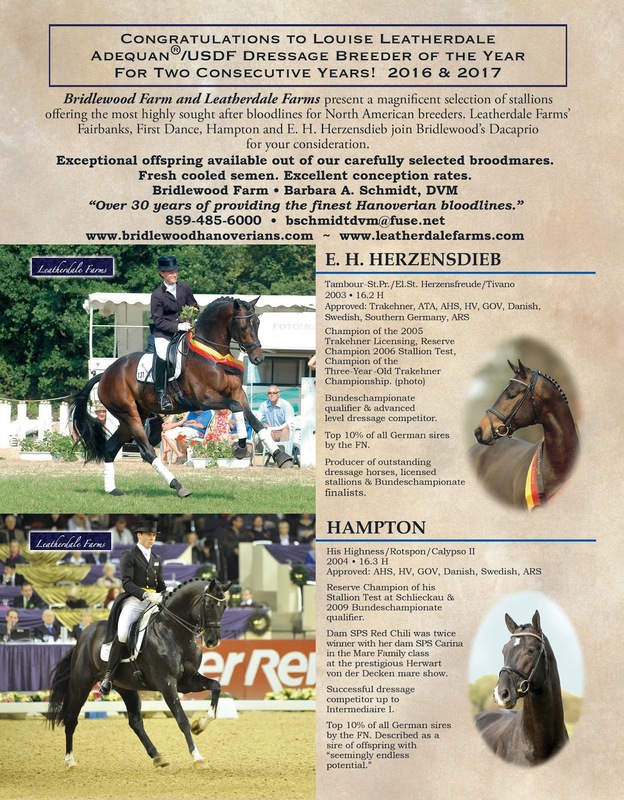 Leatherdale Farms has long-since been recognized for its high-quality Hanoverian breeding program both in the United States and in Germany. In addition to their breeder award, many of Leatherdale Farms’ young horses received recognition in the Horse of the Year awards and American Hanoverian Society year-end awards. With an impressive media score of 192, which was nearly 100 points higher than the next breeder, the breeding program was rewarded by the impressive averages of several sport horses all sired by Leatherdale Farms’ stallions. Duchess L, Hero L, Hannigan L, Fleur De Lis L and Fighting Chance L had outstanding seasons that contributed to the farm’s success. “The Leatherdale horses are very talented and the top breeding is evident in the creation of very intelligent and athletic horses,” Leatherdale Farms’ young rider Mike Suchanek said. He also credits the teams’ success to the pride Leatherdale and her late husband, Doug, had for their operation as well as their dedication and passion for the horses. “Doug and Louise really took their time and did their research to hand pick the lineages, as they wanted to create a line of horses that were talented but also had great minds,” Suchanek explained. “Louise is a very special woman – she carries on the passion that Doug also had for this sport and for the horses. She wants the very best for her horses and she cares just as much about the people she hires as she does her amazing animals! The 6-year-old Hanoverian mare Duchess L (Damsey FRH-De la Rosa, De Niro) placed third in the Adequan/USDF Second Level Dressage Horse of the Year with a median score of 73.300 percent and placed sixth in the Third Level division with a median of 73.141. The mare also took home a win in the Third Level Open and a second in the Second Level Open All-Breed award for the American Hanoverian Society. Hannigan L (E.H. Herzensdieb-Pia Colada, Pik L), a 6-year-old Hanoverian gelding, secured a third place ribbon in the Third Level Open All-Breed award for the American Hanoverian Society with a median 70.962 percent. Earning the reserve championship for the Adequan/USDF Prix St. Georges Dressage Horse of the Year was the 10-year-old Hanoverian gelding Hero L (His Highness-Waterlily L, Wolkenstein II) with a median score of 74.935 percent. In the American Hanoverian Society’s All-Breed standings, Hero L won the Intermediate I Open division with a median 69.649 percent and won the Prix St. Georges Open division. Leatherdale Farms’ 17-year-old gelding Devon L’s (De Niro-EM Wibranda, Wolkenstein II) experience shone through as he claimed first place in the Grand Prix Open All-Breed award for the American Hanoverian Society with a median 68.292 percent score. Devon L has won the award several times during his successful career and in the 2017 season he earned points with the help of both Diane Creech and her daughter, Vanessa Creech-Terauds, who also began competing in the U25 Grand Prix division with Devon L this spring. Lastly, the 8-year-old Hanoverian mare Fleur De Lis L (First Dance-EM De La Rosa, De Niro) and Vanessa Creech-Terauds won the American Hanoverian Society’s Prix St. Georges Junior/Young Rider division with a median of 69.167 percent. To view the 2018 ad for Leatherdale and Bridlewood Farm stallions, all standing at Bridlewood Farm, click here. Sea Lion is a 1998 Jockey Club-registered Thoroughbred by Sea Salute out of Ivory Today (Caveat). He is that rare animal: an American Thoroughbred stallion approved and sought-after in Europe. He was approved in 2015 by the American Hanoverian Society and the Hanoverian Verband, and was invited to stand for a year in Germany. The AHS judges believe Sea Lion’s score may be the highest ever awarded to a Thoroughbred. 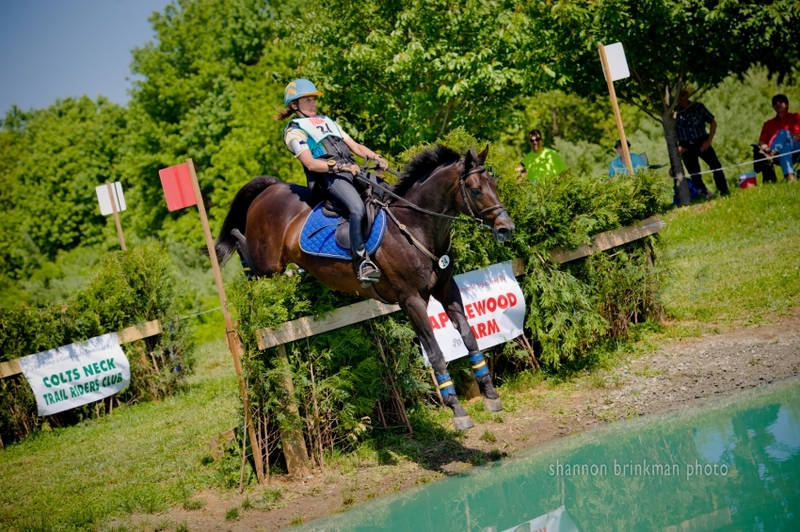 Sea Lion had already received approved status in 2013 from the ISR/Oldenburg, and the American Trakehner Association in 2014 with scores of mainly 8s and 9s. The interest in breeding to Sea Lion has come from several countries, and he now has been bred to mares in Germany, Australia, and Canada, as well as the United States. The oldest of his offspring is the 2013 Seacret Agent. We'd like to share his progress as an international sire by sharing reporting on a few of his offspring. Seacret Agent is a 2013 Oldenburg gelding bred by Gale McCreary (USA), out of a mare by Selle Français stallion Jamestown. Seacret Agent won Future Event Horse 2 and Future Event Horse 3, and qualified in both classes for Nationals. His owner reports that he is very intelligent, easy to teach, willing and charismatic. Sea Lion's first foal in Germany was bred by the Niedersächsisches Landgestüt Celle (the German State Stud, Celle), and was born in 2017. Photos will be posted when available. 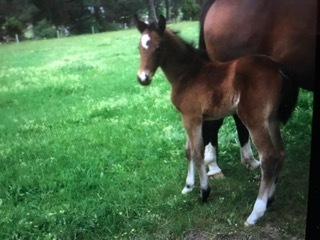 Sea Wolf is a Hanoverian colt born in 2017, bred by Meredith C Michelfelder (USA). He is out of Fuerst Flight R, by Fuerst Gotthard. Sea Sea Babcock was born in 2017, bred by Dave Coleman (Australia). 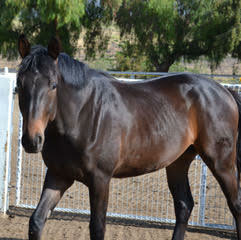 She is out of a Lord Pezi (Oldenburg) mare, and is a registered Australian Warmblood. Sunsprite Sargasso Sea was born in 2015, a Hanoverian colt out of a mare by Olympic Concorde. He was bred by Pamela Duffy of Sunsprite Warmbloods (USA). For more about Sea Lion, read his Stallion Profile: click here. 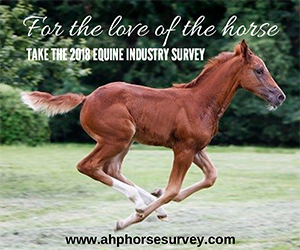 JANUARY 22, 2018 – Today American Horse Publications (AHP) launches its fourth Equine Industry Survey at www.ahphorsesurvey.com. Horse owners who live in the United States, are 18 years of age and older, and who currently own or manage at least one horse are invited to complete the survey by April 1, 2018. American Horse Publications is dedicated to excellence in equine media through education and communication. AHP strives to be the primary source of education, resources and networking for the equine media community. We believe a proactive approach in an ever-evolving communications-driven world allows us the flexibility and opportunity to promote, support and reward excellence in equine media. 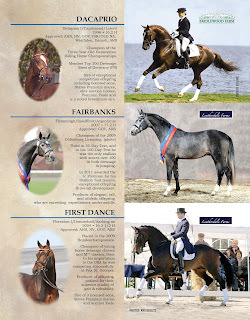 For more information, please contact Chris Brune, American Horse Publications at ahorsepubs@aol.com or 386-760-7743 or visit the AHP website atwww.americanhorsepubs.org. Escolar, one of the two top-ranked Young Horse Sires. The Horse Magazine has posted their annual analysis of the German Breeding Values. Author and publisher Chris Hector gives an in-depth analysis, including the new division into two sections: one for the sires of young horse stars, and one for sires of "competitors in open competition," i.e. sires of Grand Prix horses. He states that the Germans "are now recognizing two streams within their dressage population, and why not?" And yet in his article he has strong reservations about the sires of horses who do well only in young horse competitions. In the last ten years or more, Germany's love of flashy movement in young horses has only grown. 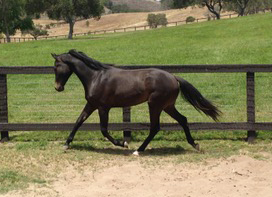 Weanlings with flashy trots sell well, and are scored well in young horse competitions. But the big trot may not be the best indicator of a young horse's ability to move on to the "big sport" later on. 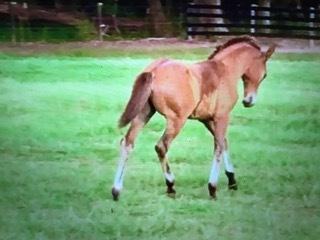 There is some concern about this focus on flashy movement in foals and youngsters that is reminiscent of North American concerns about the judging of in-hand classes. We have a way of morphing young horse classes into something that is an end in itself, rather than an indicator of future performance ability - and apparently that is a German tendency also. Dividing the sire rankings may be a way of allowing the appreciation - and sales - of flashy youngsters, while separating their sires from sires of performance horses. In this article, Chris Hector analyses the effect of this change on the rankings - the good and bad. He then goes on to discuss some of the ranking stallions, from Follow Me (Fürstenball / Donnerschwee) and Escolar (Estobar / Fürst Piccolo), tied for first at 169, on down. Read the full analysis on HorseMagazine.com - click here. "Marketing is enthusiasm transferred to the customer,"
which was attributed to Gregory Ciotti, a marketing expert specializing in software. Wait, what? To me, marketing often seems like big business trying to convince us all to buy things we don't need. I learned at a young age to be pretty cynical about marketing, so this definition sounds a bit naive to me. So often marketing has just been a way of whitewashing dubious products and making them sound appealing to people who shouldn't be buying them. Often the companies know the product doesn't have much value, but they do it anyway because they see $$$. From cheap toys that were marketed during Saturday morning cartoons, to cigarette companies that continue to make money by selling a product that has killed tens of thousands, we are surrounded by dubious marketing. The toy companies know their toys will break within a week. And I can't believe cigarette companies are really enthusiastic and excited about their newest product that will rope in new segments of the market. It's a job and they do it to make money. Actually, I think it would be even more disturbing if they were truly excited about selling cancer to teens. So marketing really deserves its bad rep.
And yet... I LOVE this! "Marketing is enthusiasm transferred to the customer." Because in my world, it's true. Marketing within the sport horse breeding community is most of what I do. I help stallion owners market their stallions; I design websites, ads, and other marketing pieces; and of course I market my own services. And this is a really great definition of what I do, what stallion owners do, and why we do it. I don't think I've ever talked to a stallion owner who didn't love her stallion and believe he's great. If she's a good horsewoman, she knows he's not perfect, and would never claim he is - but she loves him because of very real qualities that shine: temperament, movement, conformation, athleticism, intelligence, beauty, bloodlines, work ethic, kindness. There is something real that made the owner say, "This one's a keeper. This one gets to keep his parts, because he could amount to something." I am motivated by working with people who are starting there: starting with a horse they love as well as believing that he's good quality. People who see their stallion as more than just a "product" and a business proposition. I think many European breeders laugh at American breeders' love and enthusiasm. Historically they have been more business-like and practical, leaving emotion mostly out of it. American breeders can definitely improve in being objective and detached, and in treating a stallion business more as a business. But I hope we can do it without losing that love and enthusiasm. In fact, I think European breeders can learn from us a little about the joys of investing a little emotion into the business. Nikki Alvin-Smith recently published a new article on the Horse Studio website that is a good read for anyone thinking of breeding. It's entitled "Finding The Right Mate for Your Horse," and includes some general suggestions for choosing a stallion, but it's really an overview of breeding decisions. This would be good reading for someone who has not bred a warmblood or sport horse before. Ms. Alvin-Smith touches on breeding methods, contracts and expectations, where to look for a stallion, and a little bit on marketing and costs. 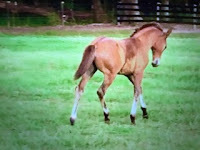 Kentucky Equine Research has posted a new article about foals from birth to two years of age. From colostrum for new foals to managing yearling growth, it covers a timeline that is of paramount importance to breeders.